The story that became a global sensation: Sophie, the Australian cattle dog who was lost at sea and swam six miles through shark-infested waters to a remote island where she survived in the wild for five months. It was just another day in paradise as Jan and Dave Griffith, along with their blue cattle dog, Sophie, motored out of Mackay Marina for a gorgeous weekend at sea. But when the sky suddenly darkened and the waves turned fierce, the unthinkable happened: Sophie disappeared overboard. Her heartbroken humans couldn't fathom the loss and could only hope their beloved pet didn't suffer. But this true cattle dog and devoted best friend wasn't going to give up that easily--and what followed is a remarkable tale of survival, luck, and persistence. 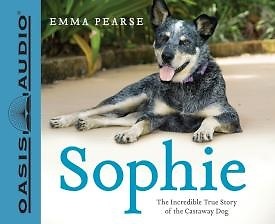 From the first day the Griffiths set eyes on puppy Sophie through that terrible October day she was lost, to Sophie's time as a castaway and the reunion that almost didn't happen, journalist Emma Pearse recreates the incredible journey of this canine Robinson Crusoe. An inspirational story of loyalty and the resilience of the spirit, Sophie offers undeniable proof about the unbreakable bond between humans and our pets--and that if lost, they would do anything to come home to us.